Hello everyone!! Kymona here with a special announcement for all of you!! I hope all of you hopped along and saw all of the wonderful cards that was created for Suzanne's birthday! If you hopped along and left a comment, you might be one of the winners for our awesome prizes!! From Sharon's blog, Jennifer Bradley wins the free month to Martha's classes. From Steph's blog, TerriLynn wins the So Suzy Stamp gift certificate. Congrats to the winners and thank you to everyone who hopped along with us!! 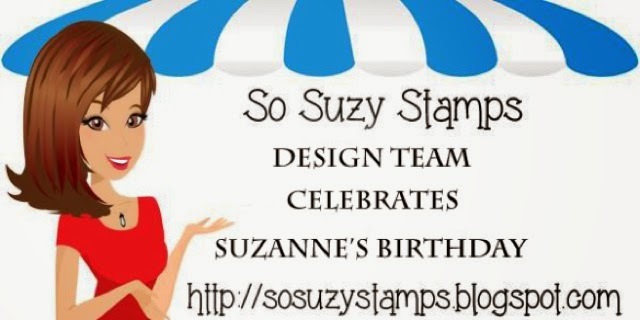 Winners please email me at kymona@sosuzystamps.com to claim your prize!! Woo Hoo!! I won! I won! Thank you so much! Happy Happy Dance!